It was too hot to bake, but I was in the mood for some crunchy ginger cookies to have with my tea. AND I was eager to play with my cookie stamps again! There was no recipe, so I did what I always do—made it up as I went. Of course, if you don't have cookie stamps, you can just use something (bottom of a glass, bottom of a stainless steel measuring cup, your hand) to flatten the dough balls into 2-inch rounds. Maybe not as cute, but just as tasty! For those of you who are dunkers—I am not, but if you are, please go right ahead—these are good dunking biscuits. Just the right size, crunchy and sturdy enough to hold up to a good dunking. As I mentioned, it was hot. So I was having a little trouble stamping my cookie dough, even chilled. But I came up with a trick I'm going to use even on cold days: a very, very light dusting of flour on the dough balls. Just flatten the dough ball a bit, flour lightly, brush away the excess, proceed with stamping (step 5 below), and there you go, no sticking! Worked well with my stainless steel 1/4-cup measuring cup I used to make unstamped cookies. Here are my Stamped Shortbread Cookies. Sooo good with tea. Tell me, are you a dunker or a non-dunker? PS Don't strain your eyes! The cookie in the middle in both photos is not stamped, just flattened with a flat-bottomed stainless steel measuring cup about 2 inches in diameter. 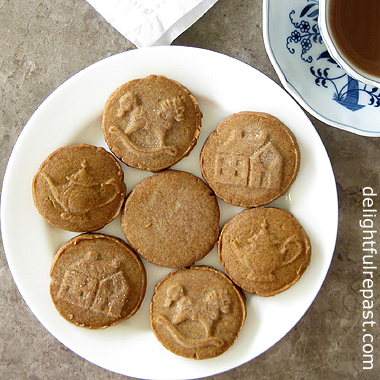 PPS If you're a chewy cookie fan, you might like my Molasses Ginger Cookies. 1 In small bowl, whisk together flour, salt, cinnamon, ginger and cloves. 2 In 1.5-quart mixing bowl, by hand or with electric hand mixer on lowest speed, cream the butter and sugar just until smooth, mixing in the molasses toward the end. 3 Add flour mixture and mix well without beating a lot of air into it. If mixture is too dry to form a dough, mix in a teaspoon of water. Wrap dough in plastic wrap, forming a 4-inch disk; refrigerate for 20 to 30 minutes. If you overchill the dough, it will be difficult to work with. 4 Using a measuring tablespoon, measure out level tablespoons of dough onto parchment-lined baking sheet. Roll the scoops into smooth balls. Cover and chill in the refrigerator for 15 minutes or so. This will make them easy to stamp, and the design will be very sharp. But if you overchill the dough balls, they will be difficult to stamp. 5 To stamp, with dough ball in the center of the stamp, press the stamp evenly till the dough reaches the edge of the stamp. Gently lift the stamp away. Repeat. My technique is to lift the stamp with the dough attached and gently peel away at the edge. This works very well with the chilled dough. If you find the dough balls getting too warm before you’re finished stamping, put the baking sheet back in the refrigerator for 15 minutes. 6 Cover and refrigerate for 30 minutes to 1 hour. About 15 minutes before you’d like to bake the cookies, preheat the oven to 325F/165C/Gas3. 7 Bake for 20 to 25 minutes, until quite firm and edges are starting to brown. Cool on baking sheet for 5 minutes. Then transfer to wire rack to cool completely. Those stamped cookies are cutest! I want one for my tea too. Thank you, Angie. I love cute cookies, and they're a must for an afternoon tea party. I love ginger cookies -- snappy or soft! So thanks for this recipe. And thanks also for the flour dusting tip. I've had issues with that before! Thank you, Jeanie. I'm so glad you can use the flour dusting tip. And you reminded me that I need to add a link to my chewy ginger cookie. Thank you, Bonnie. And I won't tell anyone you're a dunker! “Dunker”-schoen, Frau Jeani! I recognize the symptoms of CSOD – Cookie Stamp Obsessive Disorder. Take 2 ginger snaps and call me in the morning. Mmmm…molasses ginger snaps. 5 cleavers! YUMMY! I want one with MY tea. I do love ginger cookies! Thanks, good cook! My Mum used to buy us McVities Ginger Nuts when my brothers and I were kids. I have never thought about actually making them. Love the taste of ginger. They can break your teeth, or the Mc Vities type can. As Sergeant Phil Esterhaus would say: "Hey, let's be careful out there." And of course Sergeant Stan Jablonski always uttered, "Let's do it to them before they do it to us." " Grrrrrrr," I'll leave you to remind who said that!!! So ,Ginger nuts, it is. Lovely. Might have a go at baking them myself now Jean. Sully, I love it! CSOD - Cookie Stamp Obsessive Disorder! I fear you are right. And 5 cleavers - oh my! Pom Pom, thank you. 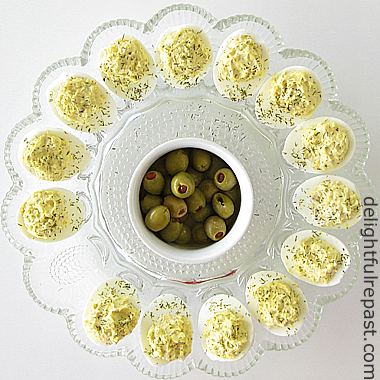 Stir some up now to have with your tea! Judy, since you're not a dunker, you're safe to have tea (or coffee!) with my husband; he has an aversion to dunking! Let me know how these turn out for you. Yes, Tony, have a go at these. I guarantee you won't break a tooth on them! Goodness, you just revived a memory I'd completely forgotten. My grandmother used to make ginger biscuits and I think she used some kind of cooking spoon with large holes in, to make a sort of dotted pattern on the back. But you know I have a soft spot for your cookie stamps! ...Haha, no invitation from your husband for me: I'd be dunking these ginger cuties for sure! Thanks, Margie. We like cute! Pauline, I always appreciate grandmother stories! And, don't worry, I'll distract Mr Delightful whilst you're dunking your biscuit! Oh how wonderful and these looks so special and historic. I love the way they are stamped. My hubby is however allergic to several things and one is ginger. It needs to be made for others right - me and others! That works too! Thanks for sharing. And I am a sometimes-dunker, so we'll see! Oooo Jean, another darling cookie with your stamps for tea time! I really must look into those stamps. I am like you, and am not really a dunker in my tea, except for biscotti. 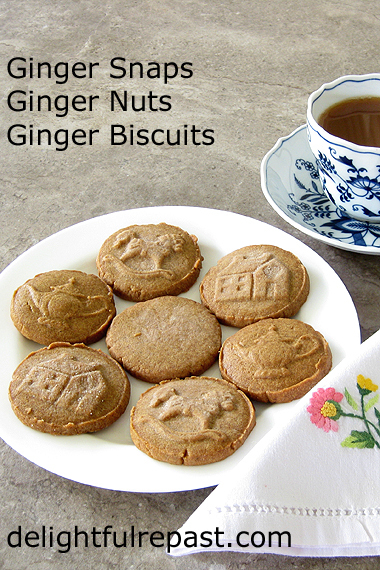 I love ginger cooks and am so glad these hold the embossed pattern! Perfect for my Polish rolling pins! Thank you, Kitty. Yes, I think you and Cissy definitely need to look into getting some of these stamps! Thanks, David. Have fun with your cool Polish rolling pins! Aw, thanks, Darlene! I hope you'll try it soon! I love the look of those. Ginger nuts are a reminder of my childhood, although they were out of a packet - very little was homemade in our house back then. I've always enjoyed dunking but not with ginger nuts due to the resulting strange taste in the tea. Thanks, Phil. And maybe you can tell me why a cookie with no nuts is called a ginger nut? Is it because of nutmeg? I'm with you--if I were a dunker, I wouldn't dunk anything that would spice up my tea. I don't like flavored teas (except Earl Grey with bergamot only). I am 1000% going to need to create this recipe GIGI APPROVED, because I friggin' LOVED this type of cookie when I was little, but I legit totally forgot about them until JUST NOW! These look lovely. I ate so many ginger biscuits when I was expecting my little boy. They were the only thing that would ease the constant nausea! Thanks for sharing with #TriumphantTales! Thank you, csuhpat1. Hope you're having wonderful Adventures this week! Gigi, thank you. With less than 1 teaspoon of sugar per cookie, I can enjoy more than one! Hope you can work out a way to enjoy them, too. Jaki, maybe *that* is why I've always liked them--I've had a lot of nausea in my life (car sick, seasick, plane sick, etc)! Being a self-confessed baking nerd I have, of course, had a few discussions with other nerds about why ginger nuts are called nuts. I think the truth is that nobody really knows - they've certainly been called that for a very long time. Most people seem to think that it's simply because they should be crunchy like a nut. Others say that it's a loose translation from the German or, more likely, Dutch (pepernoot). Personally I think its more to do with how they look. Many older recipes for ginger biscuits are harder and drier and look a bit like a hazelnut to me (and that's probably true of pepernoot too). But, then again, why are doughnuts called nuts? I'll have another glass of wine now to stop me being quite so annoyingly nerdy. Thanks, Phil! I'm always up for a good session of baking nerdery. And I can tell you from experience, the glass of wine might spur you on rather than stop you! Your cookies look wonderful, Jean. Cute too. No, I'm not a dunker but my hubby is. Personally, I don't like crumbs floating around in my tea but Hubby doesn't seem to mind. I love both crunchy and chewy and I have recipes for both. I used to make the crunchy into gingerbread boys at Christmastime. I've never heard them called ginger nuts before; interesting! I always learn something intriguing here; either from you or one of your commenters. :-) Thanks for another great recipe. Sandi, thank you so much. I love little odd bits of info and am really glad when my readers enjoy them! And I agree--I don't want any crumbs floating around in my tea! Yes, I am not a happy dunker either as I dont like anything floating inside my tea, coffee or milk. Your cookies are so pretty and great looking. Wish I had a couple right now too! Have a lovely week dear friend. Thanks, Fabby! Next time, I think I'll make a double batch and freeze some. Oh these look so scrumptious! I love ginger biscuits!! Thanks, Lianne. Wish I had one right now! I just love all these special "Ginger Treats"! Hope you are having a great week and thanks so much for sharing your awesome post with us at Full Plate Thursday! Thanks for sharing at the To Grandma's house we go link party! Thanks, John. The stamps really up that cute factor! Thanks, Tarah. I'll be back tomorrow to share another and to catch up on your latest projects. Thanks, mum! Yes, get her some of these stamps--she will have such fun with them! It did indeed! Thank you for that. Looked edible! You are so talented.